I remember the day I got my 'first' Bible. My dad took me to LifeWay book store and I scanned the shelves for one the seemed 'like me.' I wasn't looking for a particular translation or anything, just one that I could understand and stayed close to the original wording. I randomly picked out the HCSB Study Bible and have been using it ever since! This Bible has had a major impact on my faith and I've gifted the same one to three or four people since! I've used this Bible for the past six years and I love it just as much as the day I got it! It's my every day, go-to Bible. Be warned that it's a thick and heavy book, but it is full of good commentary. 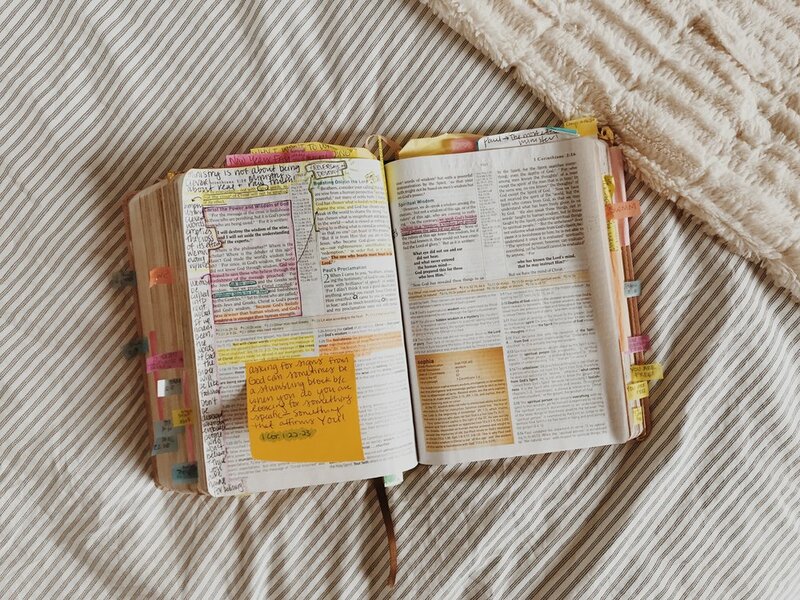 This Bible is all you need for a good study, but to be honest, if you're a note taker like me you'll need to use some sticky notes because the margins are quite small! This is my favorite translation of the Bible and the one that I use for study. I also have a regular (not the study edition) of this translation that I bring with me to church, groups, etc. I simply love this Bible for its beauty. I don't often read from it, but it's definitely the most beautiful book I own and such a nice one to have on hand! Some pages are illustrated with gold foiling of various Bible verses in beautiful typography. If you did want to use this Bible to take notes and for daily use, there is plenty of room in the margins for note taking! I originally purchased this Bible for a mission trip I went on to Nicaragua. I bought it because I wanted space to take notes in the margins (my HCSB Bibles don't have much room!). Despite it being inexpensive, I was surprised by the quality of this little book! The hard cover is very sturdy and the cover seems to be a nice quality material. The only thing I would mention before purchasing is that due the the light color of the fabric, it might get dirty easily if you plan to take it everywhere. Since it's cloth, it won't be easy to wipe off.